An automatic garage door can make your life incredibly convenient, but if it ceases to function correctly it will have quite the opposite effect. The opener is the part that allows your door to become automated, and just like any complex electro-mechanical device, it can experience a variety of different issues. Recognizing what those are will help you find the solution. One of the most common problems that you may experience is a door that keeps reversing each time you try to close it. Although there could be some blockage in the track that forces the door back open each time, the more likely culprits are the opener safety sensors. These photo-electric eyes are in charge of detecting an obstacle in the door's path. However, if they become misaligned, they can experience what you might call a "false-positive", meaning they make the opener behave as though there's an obstacle, while none actually exists. Fixing this issue requires an expert's assistance, as these components are quite delicate and performing the sensor realignment incorrectly can damage them. 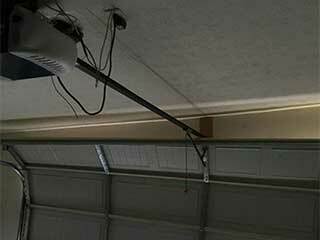 The garage door remote is another main area of potential issues. The most common problem is a simple one - dead batteries. This can be easily solved by, you guessed it, replacing the batteries. However, oftentimes the issue can be more serious, and the inner workings of the remote or its transmitter could become damaged and won't allow it to communicate with the opener's receiver. In this type of situations, the remote will usually need to be replaced. Another common mishap is that the remote - for whatever reason - lost its calibration with the opener. Replacement won't necessarily be needed because of that, but the remote will need to be reprogrammed. This is another thing our technicians can help you with. If the unit's motor starts making more noise than usual, or if its drive-system seems to be getting louder than it used to, professional assistance is required. Some opener types, like the chain and screw drive models, are naturally noisy, but sometimes adjusting or lubricating the drive-system, or replacing the motor gear can solve the issue and make your opener operate more quietly again. You may even want to simply get the entire unit replaced with an upgraded and more silent belt-drive model, especially if the new opener has some special security and convenience feature to offer you, like rolling code technology and WiFi compatibility. If that's the case, feel free to contact our team at Garage Door Repair Pasadena to consult with our experts on the options available to you.